High quality, 14k solid gold nugget design diamond cross ring. A total of 6 diamonds grace the cross ring. Cross face measures 12.5mm (1/2") x 14mm (9/16"). Ring weighs approx. 8.7 grams. 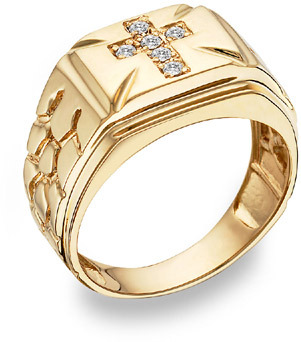 We guarantee our Diamond Cross Nugget Ring, 14K Yellow Gold to be high quality, authentic jewelry, as described above.